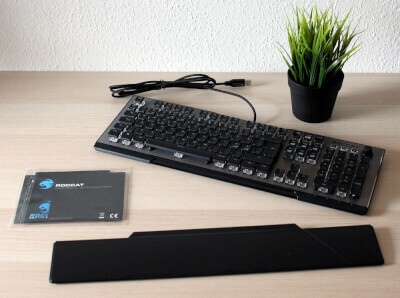 Are you on the prowl for a brand new keyboard? Then you have come to the right place. At Tweak Reviews we absolutely love keyboards, testing them, going into the littlest details with them and making reviews for you. When you are going to acquire a keyboard there are many things to keep in mind. Over time they have developed on many fronts, for instance there are three major connective possibilities, PS/2, USB and wireless. But maybe other things matter to you as well - do you want numpad? how deep should the key presses feel and what about potential input lag? Are we looking at gaming and keyboards things get even more advanced. Do you prefer membrane keyboards or mechanical switches. Which mechanical switches are best for you? There are a bunch of different MX Cherry switches, which can have great influence on your performance in games on you new keyboard. All these things and many others are important when you are going to select a new keyboard and it can be quite the challenge without a little help from a friend or the internet. That is why we, at Tweak Reviews, have implemented a series of filters, which hopefully can help you down the road of picking the best keyboard for your specific needs. If you want to view all the keyboards we have tested over the years, you should not pick a filter and thus form a great overview. Do you, however, wish to see something specific, you could choose Cooler Master under brands. In the brands dropdown, choose and click on Cooler Master. The other filters work much in the same way. Should you only wish to see Cooler Master keyboards that score a 4 or above, just go ahead and select these values. You can even apply price filters, allowing you to only be shown keyboards with a price below $119. If you are ever in doubt what different things mean on our website, you can follow the little how-to buttons. That will lead you to our dedicated area, where we try to explain as much as possible about gaming chairs - ie. which keyboard is better for FPS gaming or are wireless keyboards even worthwhile for gaming purposes. In our keyboard test section you will be able to find all the reviews of keyboards, that we have made over the years. Remember, we always review products based on our own subjective findings and experiences with the product. That is also why we guarantee untainted stories of how a product performs. The news button is meant for when you have an interest in reading the latest news about keyboards. It might be very relevant, if you want to form an overview of new products coming soon, or just recent trends and developments.